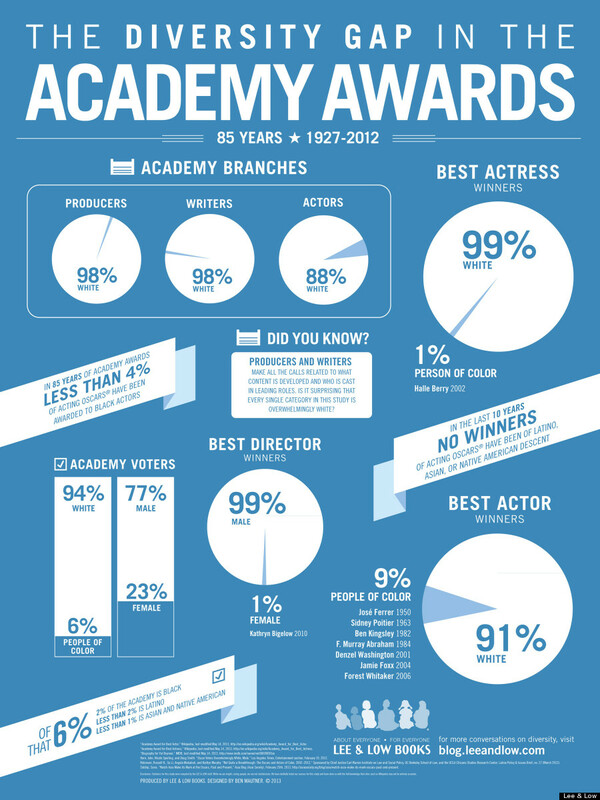 It doesn't take stat-crunching to realize the Oscars have some diversity issues, but if there was ever any doubt, Lee & Low Books has produced an infographic that verifies our long-standing complaints. It's hard to pinpoint which statistic is the most damning, but let's try this one: Of the more than 6,000 Academy voters, only 6 percent aren't white. That's a paltry 360 members. "The numbers do not surprise me because very few Academy Award-level films with non-white leads are being greenlit," Gina Prince-Bythewood ("Love & Basketball," "The Secret Life of Bees") told Lee & Low during an accompanying Q&A with several minority Hollywood insiders. "Until this changes, the abysmal numbers will not change. The box office drives which films get greenlit. The hope is that with this year’s success of a variety of films with African-American leads, Hollywood will be more open to taking chances." SNUBBED: Released in July, Woody Allen's "Blue Jasmine" received a late surge of awards support thanks to a <a href="https://www.huffpost.com/entry/producers-guild-awards_n_4532142" target="_blank">surprise nomination from the Producers Guild</a>, an often reliable Best Picture predictor over the last four years. Alas, the bump was short-lived: "Blue Jasmine" was left off the final list of nominees on Thursday, though star Cate Blanchett received her expected Best Actress nod for the film.